Now beam, I feel Durante, Dean, and Campbell were all underscored. Def. Campbell. Was really confused. What do you all think about the new format? Anyone expect Florida not to make it? Ruby is gonna get hammered because she bends her knees mid flight. And yes, Edwards has to vault better. Not sure what’s up with her. If Lexie is back for nationals, would she vault? And if so, in place of Juliana or Edwards? What about Lexie on floor? Would she replace Edwards there? I'm kind of liking Edwards on floor and I imagine she will be in the lineup next year. Thoughts? At this point, I don't think it's wise for Lexie to train anything apart from bars, where she will easily go 9.9+. Her backup is Dean, who is a huge drop-off in scoring potential. Vault and floor, we have enough cover in Cannamela and Edwards/Desiderio respectively. I thought super six was really unique and the byes gave teams to catch their breath and regroup. New format makes upsets much more likely to happen as you have to hit two days in a row to advance. Florida was the first upset of this new format. As much as I take pleasure in the fact that Florida was eliminated, I don't like that a team could be in first through fourth in national rankings the entire season and then miss out on nationals. I get that it's the same for other sports, but I'm not a fan. I wish the format gave a pass to the 4 top teams and then let the others go through the regionals. It could have happened to us as easily as it happened to Florida, especially with our injuries and illnesses. Luckily, we have some rockstars on our team who fought through adversity and got us the win. Barring an upset UCLA, OU and LSU advance. The fourth team would have to come from the OU bracket so who would you predict? Is Georgia good enough to edge out Denver? For those of us who have no clue, who is that, is she a commit, and if so, when will she enroll? That’s Olivia Dunn from ENA Paramus. She’s an elite gymnast who excels in the all around, although floor and beam are her best events. 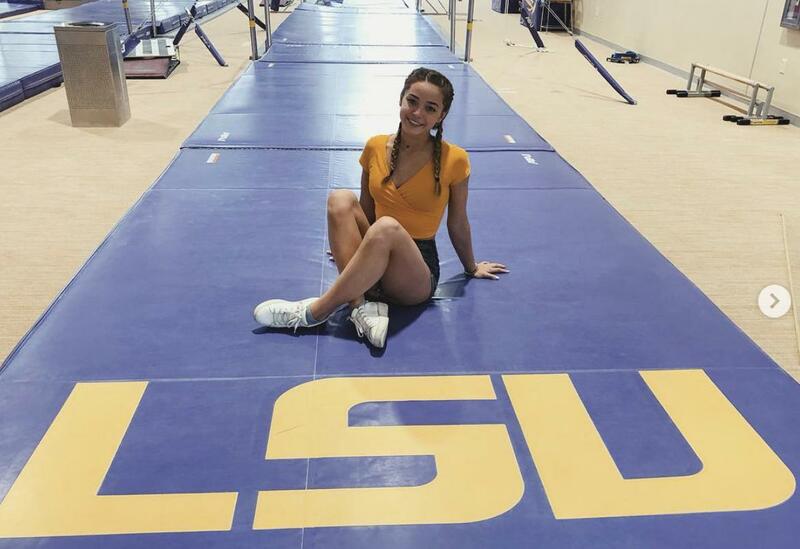 She has a beautiful swing on bars and she can vault a double full, but I expect her to do he 1.5 at LSU. She’s in the class of 2020. She vaults a double? Huh I don’t think I’ve seen her do more than a full. I think she’s been injured this winter- she didn’t attend camps and posted something recently about just getting back to tumbling after time away. her gymnastics when she’s on reminds me some of trinitythomas-very beautiful to watch. Dunne only competes a full. She does a nice full but the 1 1/2 would be her vault in college IMO. The full is way too easy for her already. She does train a double but its sketchy. I think the 1 1/2 would be perfect for her. She rested these last 4 months from tumbling and vaulting. She still did some work on bars and beam while her ankle healed up. Honestly she is not the ideal elite gymnast because she is inconsistent on all the big time elite skills but the simple stuff she does is flawless and why she is going to be a super star at the NCAA level. Just imagine her doing watered down routines. She is going to be big for us. I’m still not sure of the new format. The play-in is kind of worthless imo. Regarding Florida, I think they were a little overscored all year, especially at home. Inflated scores kind of give off a false sense of security, which is what I think happened in this case. LSU had some very low scores during the season, which kind of kept them ‘grounded’ (if that makes sense). They literally have faced so much adversity (losses and injuries and illnesses) all year. That’s why they responded the way they did. So proud of these fighting tigers! Dunne has trained the double full in the past. It was actually not that bad, although it was on soft mats. She never competed it in competitions because of injuries and setbacks. And I agree, the full is super easy for her. That’s why I expect the 1.5 in college. I kind of see Livvy as a little Myia. Myia was beautiful to watch and picked up easily in college (1.5, Ray on bars). I think Livvy will do the same. I’m pulling for Sarah. She is truly an AA gymnast. I like Ohashi. I think she has the ‘fame’ on her side but Sarah does more for her team. LSU wouldn’t be at nationals without Sarah. I think UCLA would still be there without Ohashi because of their depth. I fully expect Ohashi to win. Everything this year will go to UCLA. It has all been pre-determined. However, there is a chance that they actually vote on who is the best overall gymnast and Sarah would have to win. I just think they will look at the media circus around Ohashi and the fact that she receives a 10 every week on floor and think she must be the best. Finnegan's floor runs circles around Ohashi but she doesn't code whore and find ways to not have to land passes on your feet.